Geneva, 2 May 2016 – A record 175 documents proposing new measures and policies on international trade in wild fauna and flora were submitted by the 27 April deadline for consideration at the World Wildlife Conference - the 17th meeting of the Conference of the Parties to the Convention on International Trade in Endangered Species of Wild Fauna and Flora (CITES CoP17). Among these documents, 60 are proposals to amend the lists of species subject to CITES trade controls were submitted by over 80 Parties from across the world. 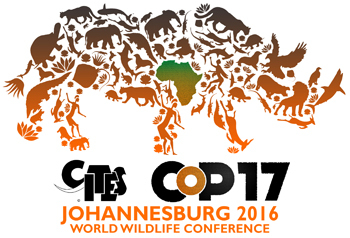 These proposals and documents will be decided upon at the triennial meeting of the 182 Parties to CITES (181 countries and the European Union), which will be held from 24 September to 5 October 2016 in Johannesburg, South Africa. The proposals are now available on the CITES web site in the languages and formats in which they were received. Parties have 60 days to provide their comments on the proposals. The CITES Secretariat will also invite comments from relevant intergovernmental bodies. The CoP17 agenda furthermore features 115 working documents that analyse a wide range of wildlife trade issues, and recommend new measures and policies concerning international trade in wild fauna and flora. While most of these documents have been prepared by the CITES community in the course of the last three years, some 40 additional ones were submitted by Parties by the deadline of 27 April 2016. “CITES decisions determine the international rules governing trade in wildlife. CoP17 is shaping up as one of the most critical meetings in the 40+ year history of the Convention, with the agenda addressing a vast array of issues, including bringing new species under CITES trade controls, changing the current status of existing CITES-listed species, supporting legal and sustainable wildlife trade as well as a broad range of measures to tackle illicit wildlife trafficking, such as fighting corruption, enhanced enforcement, targeted demand reduction and supporting local livelihoods” said Secretary-General, John E. Scanlon. CoP17 will be the first meeting of the Conference to Parties following the adoption of the historic resolution by the United Nations General Assembly (UNGA) on tackling illicit trafficking in wildlife in 2015 and the 2030 Agenda for Sustainable Development and Sustainable Development Goals (SDGs) which further recognized the important role of CITES and fundamental legal framework it provides to regulate legal trade and tackle illicit trafficking in wildlife and to contribute to tangible benefits for local people.